I was checking the other day for a new Casio ana-digi combo watch and found this upmarket model, the Casio MTG-1500-1AER. MTG series 1500B from Casio – but is it value for money? 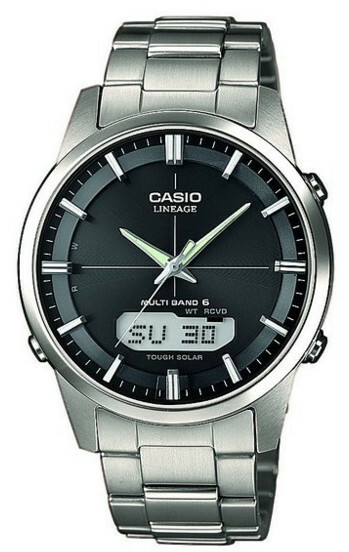 The specification and function set was more or less what I was looking for and is one of the few Casio analog and digital models with full hands as opposed to skeleton style. I’ve always found the skeleton hands to be much harder to see in both daylight and night, especially on Casio, as the luminosity, apart from their Divers range, whilst OK, is not the best. So decent filled hands are what I was looking for, which will at least maximise the luminous effect and the digital window is large enough to be visible. I was also glad to see this had a positive display as the negative displays always have clarity issues. So all seemed pretty good, until I compared it to my older model Casio Tough Solar WVA-470, I realized in regards value for money, this newer MTG model might fall short. 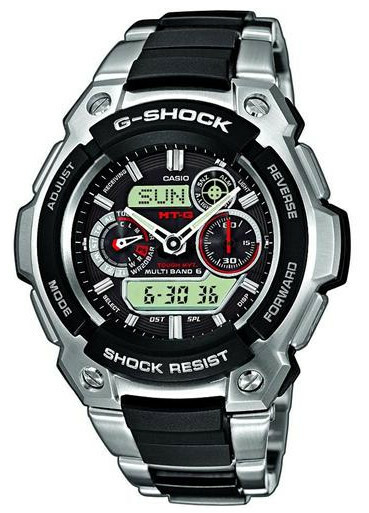 The MTG shown here is over £500 here in the UK which I think personally is pretty steep for a Casio G-Shock in this style, especially in comparison to my own Tough Solar Casio which cost UNDER £100. I’m really struggling to justify the large price differential. 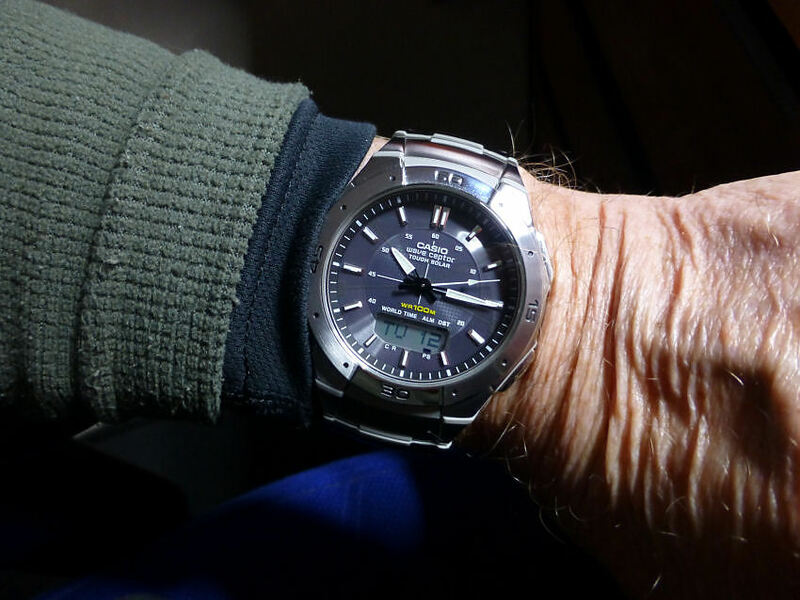 My own Casio WVA470 on my wrist as I post. My older WVA model has almost the same functions, 2 receiver Radio Control (as opposed to 6), Solar, 1/100 sec Chronograph, 3 Alarms, battery indicator and with decent analog hands, a center seconds hand and a good digital display. Function indicators on the WVA model are small digital indicators within the display, which are neat and take up very little dial space. The bracelet is also all stainless steel without the resin inserts of the MTG model and very comfortable too. It also doesn’t have or need in my opinion, the bold instructions on the bezel or any of the overdone lettering and doesn’t suffer from any kind of dial clutter. AND it’s a neater size at just 42mm width and only 12mm depth and as regards toughness – well the Tough Solar models have always been pretty decent in that respect. So a little disappointed by the price of the newer MTG model, as the advantages(which may be debatable) don’t seem to justify the large price increase, to me at any rate. Far from upgrading my Casio models now, I’m looking at just what you are really getting for the money, especially in the light of the much higher prices being asked for this range. Which is of concern as Casio and G-Shock models have to me always represented real value for money, so it’s a shock (excuse the pun) to find a range from Casio that might, value wise, fall short of my expectations. 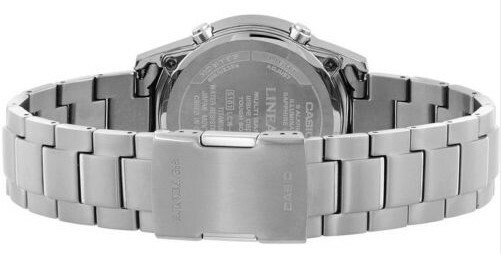 Well I’ve been considering replacing/adding to my old Casio collection and whilst the models I have are still available, I want one with more rugged features and added functionality if possible. Basically I would like one that maybe has an additional function or functions, like a Digital Compass or perhaps Solar Power or maybe Radio Control. Now perhaps at first glance this seems an easy find, but I have one overriding requirement – size. My preference is for analogue with a secondary digital display. This latter reason (2) simply because – I take my watch off, lay it on the window ledge or bedside cabinet and with digital only, at my age without glasses, there’s no way I can tell the time. Also in bright daylight or some interior lit situations, it is often quite difficult to even make out the digits – so Hands are a must. Checking out the Casio range I looked at the Pro Trek range as I like the extra functions they can provide, but the diameter (width) is often 50mm+ which for my smallish wrist, frankly, is a bit silly. The only ones that come within my size are the “slimline” series, or PRG110 style, but these are solely digital. 47mm is the absolute maximum diameter to fit my wrist – no exceptions. Analogue/Digital but must have good clarity/contrast etc. 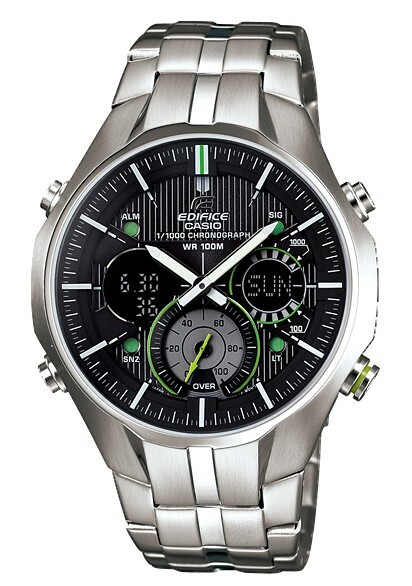 Usual Casio functions package as my minimum standard – incl World Time. Added functions – if useful to me – Solar powered, Compass and/or Radio Control etc. G-Shock models were out of my size range, most at + 50mm, with the odd one at 46mm (the 960 series) but again digital only. The Standard analogues (GAC100) were also +50mm and some of the Digi-Ana models not only too large at + 50mm, but many had cluttered dials and part or full skeleton hands, which did nothing for readability. The G-Lide series whilst actually OK size wise, were not quite the specification I required and having a permanent “tide info” display, didn’t appeal, not being the nautical type. However the “standard” range seemed more promising. The Tough Solar AQ-S800W-1EV is only 42mm diameter and 10.6mm depth which is ideal – with World Time for 31 Time Zones and Solar Powered, it is a pretty good specification. It also has the hour and minute hands in white edge & lume with the hands overlapping the centre pivot which I like. Finding this one was at least a start, as I was becoming apprehensive that no Casio was actually going to meet my requirements! Resin body with mineral crystal, 100m Water Resistance, Solar Powered, World Time, LED light for the digital display, Chronograph, Stopwatch etc, 5 Daily Alarms, Auto Calendar, Hourly Time Signal, Long sleep time of 23 months in darkness on full charge, very light weight at only 33g. It is also a nice clear face which means clear to read and without being cluttered as so many models can be. This could be a pretty good update of my current models and Solar Power is a nice additional function. The others in the Standard range AW 80 series are basically the same as my old models – in fact the AW-80V-5BV looks exactly like my old Telememo 30 with it’s cloth strap too. So a bit pointless in getting one of those . . . .LOL. The fact that it’s still made is a testament to it’s popularity I guess – so not a bad purchase those years ago. However this is a bit larger, I assume owing to the Digital Compass and Thermometer functions and is right at the limit of what I can wear. I do have a couple of other watches at 45mm diameter and I just manage OK with those. This model is 46.8mm diameter x 13.6 mm – and I hope the depth does not cause an issue. It’s the smallest diameter Casio with Compass I’ve seen, the rest being huge. Once again the dial arrangement isn’t cluttered, the hour & minute hands are broad & lumed (no centre overlap, but clear to read), a decent sized digital display @6 with good contrast and large figures, large solid numeral markers on the hours and a neat twin spoke & arrow red colored pointer hand for the compass indication. Whilst the Thermometer sensor is of no real benefit to me, like the old Telememo, it is not permanently displayed but demand only, so doesn’t add to dial clutter, which is fine. 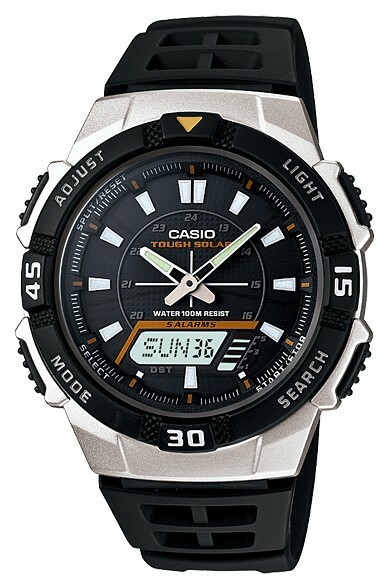 Other specifications are – 100m Water resistance, Resin and aluminium case, World Time (31 Zones etc), Digital Compass (North) which has bidirectional calibration, plus Magnetic Declination correction, Thermometer, Stopwatch, 5 daily alarms, Auto Calendar etc etc – or the Casio “package” as I call it. This certainly appeals, as I have always had a liking for a compass watch, especially as most are giants, well over 50mm and frankly silly. 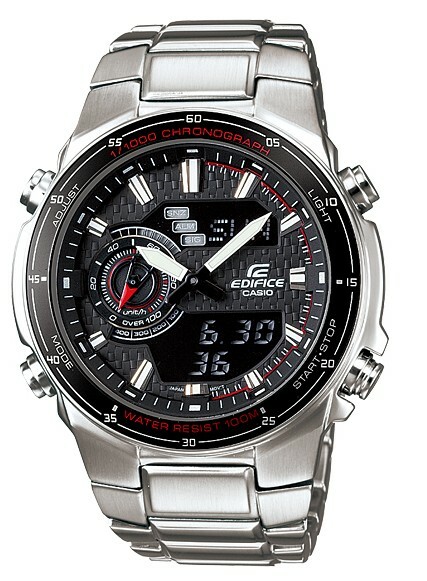 I also looked at the Edifice range and two models were of some interest but had no function advantages over my current models and I did not some issues not least of which was clarity with both the ones I looked at. Model – EFA-135D-1A3V is neat at only 42.8mm diameter and 12.7mm depth (ideal in fact) and has a neat dial arrangement, not too cluttered and at first looked OK. But – I had a chance to see a few images of the actual watch and at no time could I easily see either of the digital displays clearly. These in reality were quite small and dark and this is where pictures on the web can be so misleading, so I am very unsure as to whether it should be a contender . The EFA-131D-1A1V is similar in function though slightly larger at 46mm and thinner at 12.5mm. The dial is not too bad, the broad white hour and minute hands helping, though the seconds sub-dial @9 is a little cluttered for me. I also noted permanent signal markers on top of the upper digital display window which seem obtrusive. 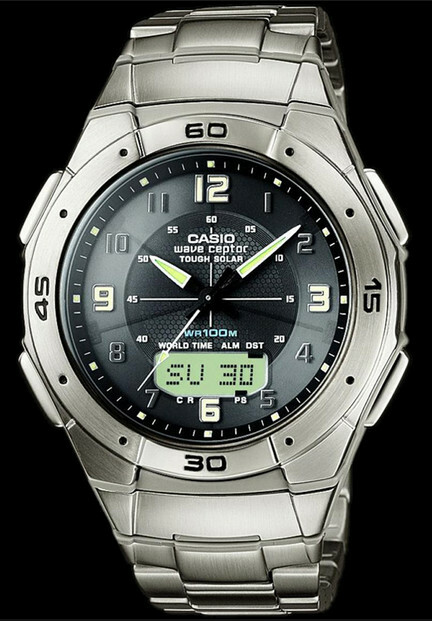 I also noted a You Tube video on this watch and whilst the digital displays seemed quite bright, the dial overall appeared over shiny and reflective – a feature I’ve noted before on some Casio models. So again I have reservations. Specification wise as the other Edifice without the anti-magnetic reference. So the Edifice models I’ve discounted, basically as whilst modern looking, they offer nothing new or added in the way of functionality and clarity really looks as if it would be a problem for me. 1 – The Tough Solar AQ-S800W-1E – Ideal size, standard function set, good clarity PLUS the addition of Solar Power. Under £40.00. 2 – The SGW-500H-1BV – Size within criteria, standard function set, good clarity PLUS the added Digital Compass. Again inexpensive. On investigation however it appears that neither is readily available in the UK. New Zealand Yes, South Africa Yes, Hong Kong Yes – but NOT UK! Either is a good choice. For a straight replacement with added Solar Power the Tough Solar model is good and the Outgear model with Digital Compass is attractive in the SGW500H 1BV series (there are a few versions/colors etc). The prices are good (low actually) and could be worth sourcing either one out of Hong Kong – I can wait 3 weeks or so. But I do have the feeling this range must be a cheaper made product in comparison to their larger Pro Trek range – so I’ll wait and see. 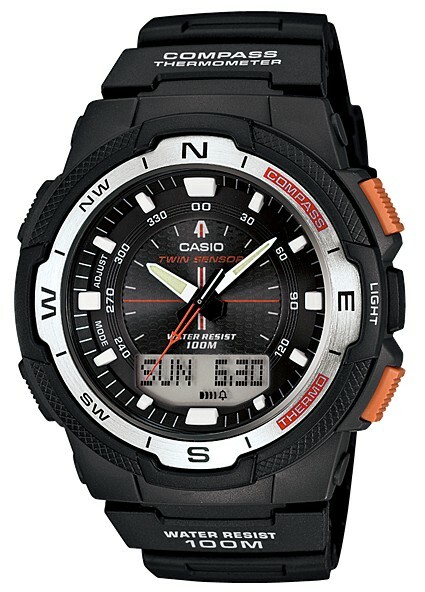 After considering the Casio models, it’s made me question the availability of Digital Compass models at a sensible size! And it’s got me thinking perhaps other Makers might have alternatives that are not so large. So I’m checking out Swiss Army and Tissot T-Touch – and any others I can find albeit more expensive. It also looks like the subject of my next post has just been decided. . .